Leah's Crafty Life: 2nd Annual ODD Holiday Hop!! 2nd Annual ODD Holiday Hop!! I'm aliveeee my friends... I've been sick going on a week now.. terribly allergies settled into my chest and has made me feel like I've had asthma or something.. coughing non stop.. ribs hurt.. you get the picture. I'm finally starting to feel more like myself a little bit with more energy every day. Thankfully, in time for the 2nd annual Some Odd Girl Customer Holiday Hop.... ANYONE can participate in the hop.. I love that!! Read more about it above!! I cut away some of the pom poms on the trim to make room for the bells. 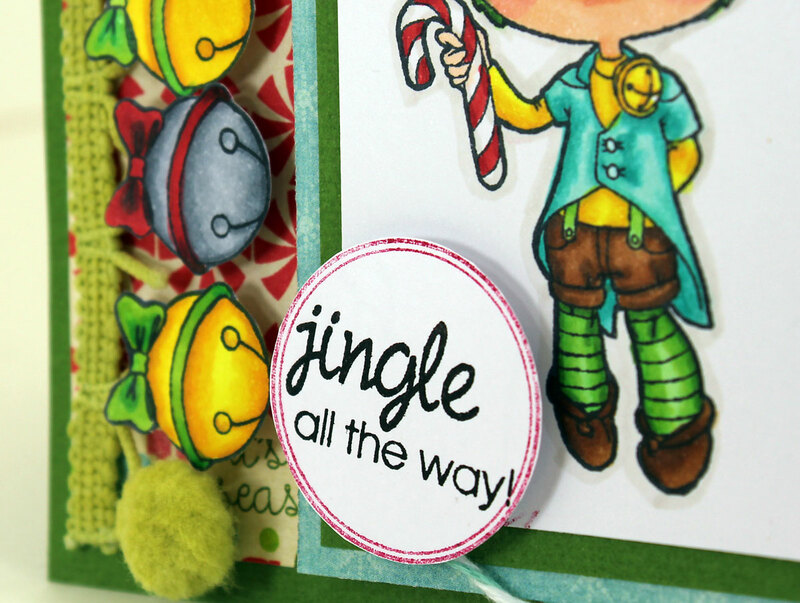 i also used the circle stamp from the Deer Mae set to house my sentiment. 5 more sleeps until Christmas... my kids are getting super excited! EEEK! I heart the bells and balls border! hehehe. I think its perfect for a Men's card! What men wouldn't want their bells jingled? XD I'll stop but you started it! LOVE how elf tobie looks with his green hair! Thanks tons for hopping Leah! LOL! Just awesome Leah!! Fabulous creation and I totally *get* your humor. HYSTERICAL! I'm totally like an 8th grade boy sometimes;) Love it girl! Balls and bells. Perfect combo. Such a neat design touch, Leah! ;) Tobie looks so cute with his little blue outfit on!! 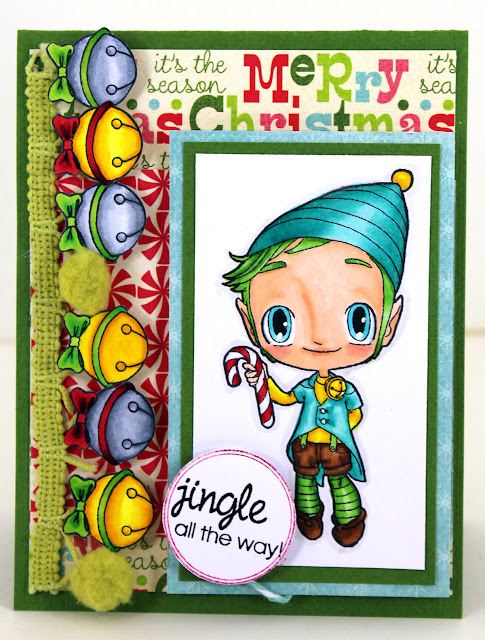 Awww, this is adorable I love the bright colors and how you've used the bells!!! Gorgeous! Hugs and thanks for linking with the Odd Girls! oooh what a fun card!! LOVE it! wow this is so fabulous...love all these bright fun colors...great coloring.. EEEEP!!! I can totally see his facial features! Well done indeedy. Those Jingle bells just make me wanna sing!! So glad you are feeling better in time to join the hop linky!! YAY!! Very, very cute! I'll bet the kids liked it, too! Happy Holidays! Such a cute card! I am loving the bells, and what an amazing job coloring! /WHEW I'm so happy you went with mens and not NT b/c I would have lost! hahahaaa Love this girlie!!!! !